We love the new look. Very tailored. Found throw pillows that tie it into the decor of the room. Good quality. The Madison Park Levine 4 Piece Tailored Bedspread Set provides a luxurious transitional update to your bedroom decor. This oversized khaki bedspread set features a diamond quilting pattern and a button trim that adds a charm and dimension to the bedding set. Matching shams mirror the design of the bedspread for a fully coordinated look, while a decorative pillow provides the finishing touch. Made from 100-percent cotton percale, this beadspread has a 24-inch drop and is tailored to create an elegant and fitted look. I am very happy with this bedspread. No need for a bedskirt! It gives the bedroom a more dressed up look, and it would be easy to add pizzazz with pillows. Excellent weight. Great bedspread. Nice length, nice color, and appears to be well made. Really like the button closures on the corners and pillow ends. Add an interesting, tailored look. What a beautiful set! The material feels amazing and is extremely well made. I actually used this for a day bed in my living room. It covers the mattress and box spring very well and looks like one piece. Classy & well made. Just make sure you Wash according to instructions because it is quite delicate. I bought this to put on a queen bed in my guest room. The color is khaki and very neutral and has a clean tailored look. It completed the calm look I was going for. I added a chair with some color to it. The quality of the bedspread is very nice which buttons down at the bottom corners. The pillows are nice as well. 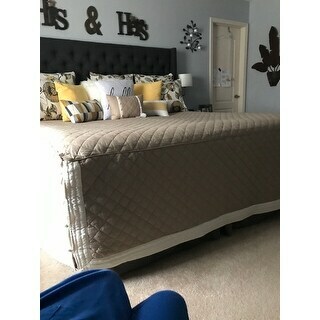 The bedspread is exactly how it looks in the photo-good quality also. Love it. I like the fit and style of the bedspread, however when received, all the pieces were covered in small loose threads that I needed to remove and one of the shams had a button missing on the side closure. This company could use some improvement in their inspection process prior to the final packaging. Ordered this and it came promptly. Fits my queen size bed perfectly. The shams and small pillow included are a bonus! It s my first order from Overstock and I will be back! Thanks! Finally a quality bedspread! Have been looking for something that doesn’t look messy. Tired of all the hot comforters and thousands of pillows. Love the simple high end look. It’s about time! Thanks! Love this bedspread, so glad I decided on this color. I did not even unpack this item,so I cant comment honestly. This is a classy spread. It reminds of the spreads that they use in hotels. It’s so easy to make the bed when you own this kind of spread. I love how neat my guest room bed looks. I will certainly be purchasing another. Good quality. Had to respect a button onto spread that came off almost immediately. Other than that, very satisfied. Yes.love how it fits on bed. Love my bedspread. Only complain is it didn’t touch the floor. Had to get a cream bedskirt. Also one of the buttons were missing on the left side of bedspread. But other than that. I love it. Although this is very pretty, the material is super thin. I have 2 holes in the fabric and it lost three buttons the first time I washed it on delicate. "I would like to know if you can tell me with "real eyes" the true color on this bedspread set. From the photograph shown it indicates Khaki color is that beige? can it have a hue to khaki/sand or Khaki/taupe/gray?... your department hopefully can help, but not just reading what color it is, but to really LOOK at the color with your eyes. Can you do this. It is a challenge to buy online concerning color, so if you can help me to decide to buy this product, I would appreciate your help to need to know. I have a mauve color in my bedroom and I require more a hue of taupe/gray to the Khaki color. Can you help me? I really like this item, but I cannot purchase and gamble on not knowing the TRUE COLOR. Thank You." This is more of a khaki. I hope it helps. "Love the ginkgo leaf painting. Do you have info on it?" Unfortunately no, the painting is not available. "This Khaki color looks more taupe/gray. I need a true sand/beige color. I know photos can be deceiving taken in different light. 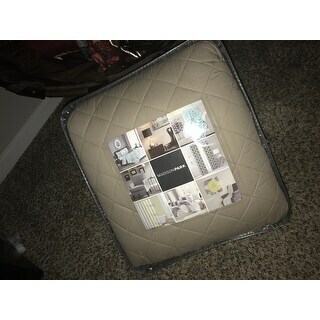 I love this bedspread but if color tone not right and not taken out of bag, can I return it?" "If it’s fitted and as advertised the Full/Queen is a one size fits all? Is there not a difference in width between a full and queen. How can it be tailored? I’m confused because a full would be too tight on a queen. And a queen would gape in a full. ????" "I would like to see what the brown looks like and what bed skirt would go good with the Spread"
"I have to tuck in the end of bedspread into my wooden base Does it open up in the corner end?" Love the ease of a bedspread. Love clean classy tailored look.